Enjoy the culture and other features of Barro Preto. Travelers appreciate the restaurants in this welcoming city. Liberty Square and Mineirao Stadium are just a couple of the must-sees in the area. A vacation rental can help make your stay complete—many rentals come with a full kitchen and laundry facilities. Fly into Belo Horizonte (PLU), the closest airport, located 4.9 mi (7.9 km) from the city center. If you're unable to find a flight that fits your schedule, you could also fly into Belo Horizonte (CNF-Tancredo Neves Intl. ), which is 20.1 mi (32.3 km) away. Where to stay near Barro Preto? Our 2019 vacation rental listings offer a large selection of 10 house rentals near Barro Preto. From 8 Condos/Apartments to 9 Studios, find unique vacation rental for you to enjoy a memorable stay with your family and friends. 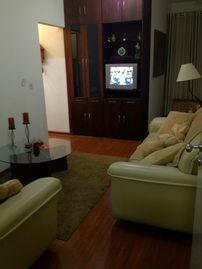 The best place to stay near Barro Preto for a long holiday or a weekend break is on HomeAway. Can I rent Condos/Apartments in Barro Preto? Can I find a vacation rental with pool in Barro Preto? Yes, you can select your preferred vacation rental with pool among our 3 vacation homes with pool available in Barro Preto.